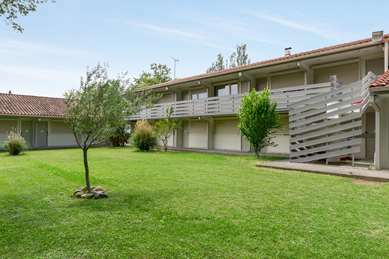 In a tree-lined environment, less than 1 minute from Plan de Campagne and 5 minutes from Les Milles, Hotel Kyriad Aix – Les Milles – Plan de Campagne is the ideal place for your business trips, vacations and weekend getaways in the Aix-en-Provence and Marseille region. Our hotel is near highway A51 (exit 1). 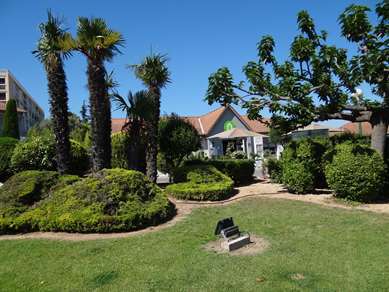 It is also close to the Cabriès and Les Milles golf courses, and the Bouc-Bel-Air leisure and sports centers. 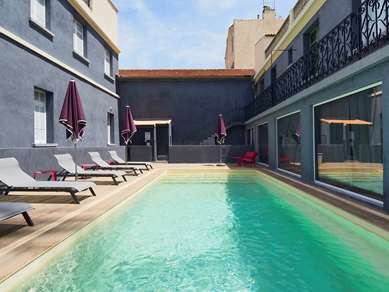 It is just a few minutes from the Aix-en-Provence TGV train station and the Marseille-Provence Airport, in the heart of the La Malle Bouc-Bel-Air ZAC and the Plan de Campagne shopping area. 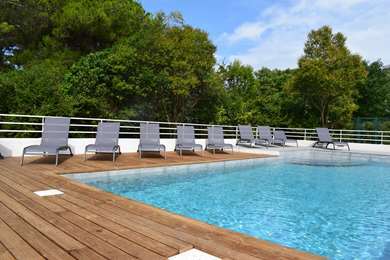 Come enjoy the comfort of a new 3-star hotel-restaurant combining contemporary design with new technologies, a swimming pool and fitness room. 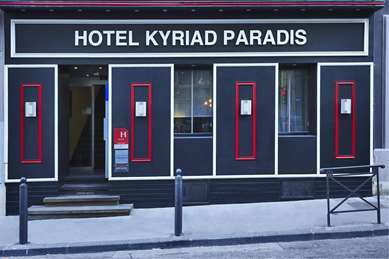 Hotel-Restaurant Kyriad Aix – Les Milles – Plan welcomes you throughout the year in French, English, Italian and German (also Russian on request). Our establishment is wheelchair accessible. 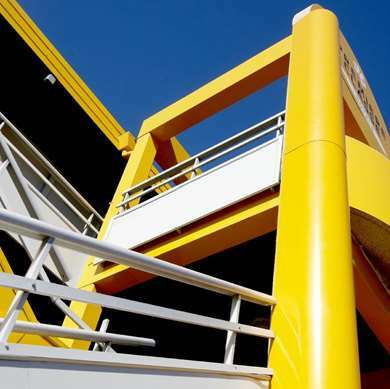 Disabled parking spaces and specially adapted rooms are available to accommodate people with reduced mobility. Explore our beautiful region: Aix-en-Provence, Marseille, Camargue, Les Baux-de-Provence and Sainte-Victoire. Take some time to visit the museums, including Mucem, Granet, Cantini, the Old Charity, Cézanne, Pagnol as well as the Belle de Mai neighborhood (the environment of Plus belle la vie), without forgetting the local vineyards (Bandol, Cassis, Coteaux d'Aix). Our regional cuisine will not fail to delight your taste buds. 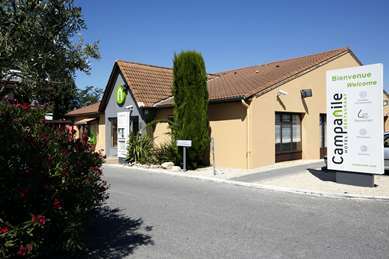 Hotel Kyriad Aix – Les Milles – Plan de Campagne has 78 new 215 sq. ft. rooms with all the amenities, and can accommodate up to 3 people. Some of our rooms are specially adapted for people with reduced mobility. You can choose between our double beds (63" X 73") or two single beds (35" X 79"). 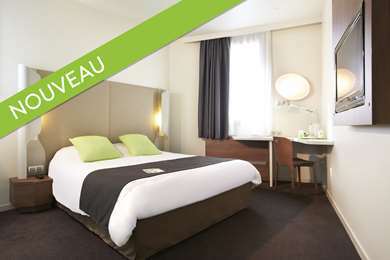 All rooms have a large flat-screen TV (with beIN SPORTS), air conditioning, free Wi-Fi, desk with phone and bathrooms with shower and hair dryer. A courtesy tray with kettle, tea, coffee and cookies awaits you in your room. 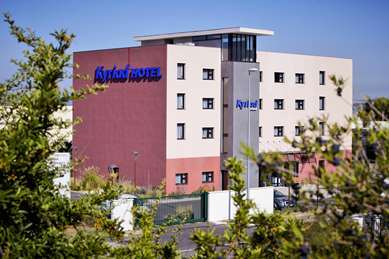 Come enjoy our all-you-can-eat breakfast buffet at our Hotel-Restaurant Kyriad Aix – Les Milles – Plan de Campagne. Each morning, from 6:30 am, we offer a very complete buffet so you can make your own breakfast filled with flavor and vitality. We were passing from Santander to Torino. The hotel is nice.well equiped and clean. Swiming pool good. The only problem was the exact address! GPS did not recignize it, so we had to go around for 45 min. or so. Very good for have a stop. Breakfast needs to be improved because it is too poor. Polite at reception But bad English speaking some of them. Easy to reach and good parking area. It's a clean and kind hotel. All staff are smiling and helpful . Foods are ok and it's close to many place . Hotel is smelling lavander arround the hotel many lavender plant is availed. Just ask them they are ready to help. 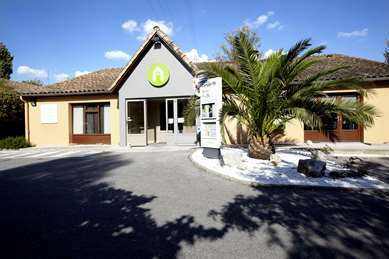 Stayed here for a night to visit the little town of Aix-en- Provence, room is quite big for us and clean too, wifi works great and we had a great stay. Outdoor pool, a restaurant and a fitness center too. Neat and clean pillows with superb bed to sleep tight. Thank you for this great comment. Nothing good to say about this hotel. Staff barely speaks English. Gave me a room with a broken airco. Then tries to make it appear if nothing was wrong with it (judge picture with leakage for yourself). They expected me to sleep in a room where it was 30 degrees. When asked for room change, first they said the hotel was full then changed it into 'airco is broken in all rooms'. Opening the window resulted in musquito attacks. Room was dirty with stains, bathroom was dirty with stains. Carpet had cigarette burns. Carpet in hallway had green! and brown stains. Wifi was slow and unstable. Only got better at night (less users). When we complainted at 3 a.m. for second and third time (still could not sleep from warmth) they prommissed to give the money back in the morning. In the morning staff changed and said he could do nothing in refund, only free breakfast or a voucher for a free night in coming six months. This new guy explained that airco is not possible at this part of the year and can only heat. Something which was forgotten to mention on the website and at check-in. He called his manager but she did not want to do anything about it. As this was the last night before we would drive home and i was now too tired to do this and we had to book another night. Ofcourse at a different hotel. To me Kyriad is on my blacklist.